Yay! I'm glad you're back and that you had a great time. 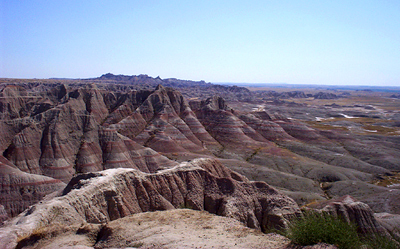 I've never been to the Badlands, but you know Theodore Roosevelt loved them so they must be cool. I'm always entranced by facial reconstructions too. The one a few years ago on King Tut was particularly interesting. I find facial reconstruction fascinating, too, not just the ancient but the modern forensic reconstructions. Stephanie: they are VERY cool. Even cooler when you look out and realize that what you're seeing is all buried under your feet too! Anassa: Thanks! You find the best links! The more we learn about Neanderthals, the more interesting they become, I think! Wow, that picture is so COOL. That place looks AMAZING. Also I'm loading the facial reconstruction thingy now. I LOVE these kind of things. It's cool to be able to look at ancient ancestors etc. One of these days I will have more badlands pictures to post and share. It is a really neat place, for sure! :) Maybe I will email you some higher res ones when I get them.